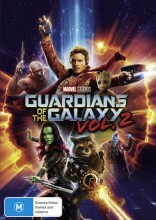 The Guardians Of The Galaxy 2 DVD sees our favourite heroes back in 2017 set to the backdrop of Awesome Mixtape #2, The Guardians of the Galaxy Vol 2 DVD continues the team's adventures as they unravel the mystery of Peter Quill's true parentage. The Guardians of the Galaxy Vol. 2 DVD has been a long awaited movie release after the huge sucess of the first movie. The whole family will love The Guardians Of The Galaxy Volume 2 DVD. Click the button below to add the GUARDIANS OF THE GALAXY 2 to your wish list.